Rocky’s Cyclery and Fitness has been at this location for nearly forty years. Viewed from the side, one is struck by how big and rambling Rocky’s actually is. Just off of the sales area in the front of the building is owner Carol Poston’s office and a well-equipped workshop, both of which most regular customers have wandered into at one time or another. There’s also an apartment on the second floor. Anyone venturing a bit deeper into the building to, say, the dimly-lit rooms in the basement or the squeaky-floored rooms behind the workshop will most certainly find a great number of bikes as well as the parts needed to service them. And just maybe, one might also come across a ghost or two. 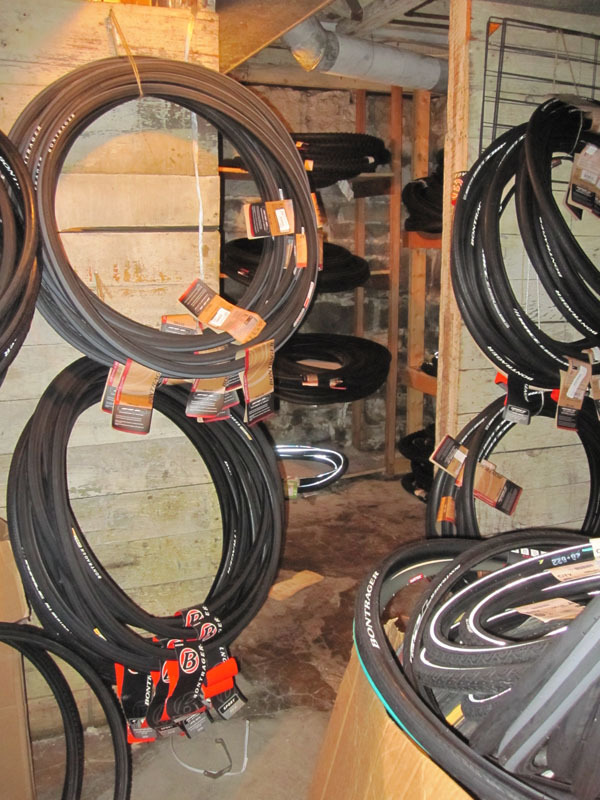 The tire room where, according to bike mechanic Jessie Greene, the tires have a habit of moving by themselves. 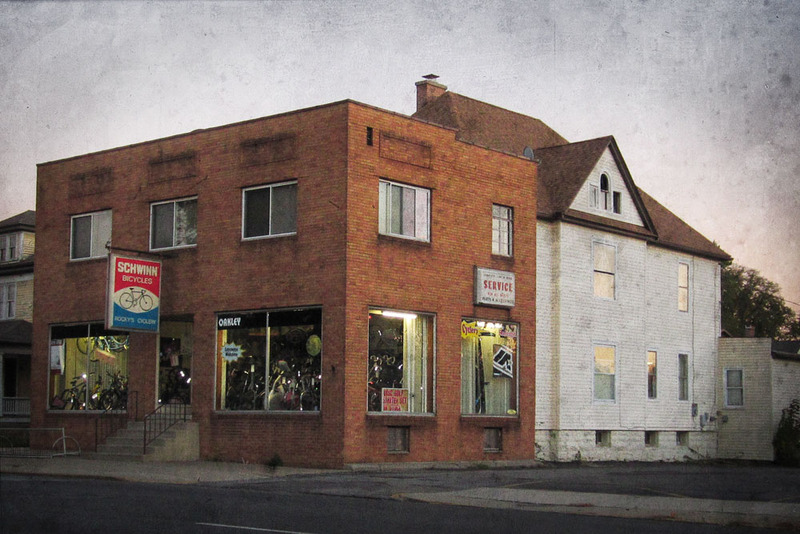 Rocky Rhoades, the shop’s namesake, opened his first bike shop in 1972 in downtown Marion before moving to the current building in 1974. In 2003, having been diagnosed with pancreatic cancer, Rocky sold the business to Glen Poston, himself a passionate and devoted bike rider, and Glen’s wife, Carol. 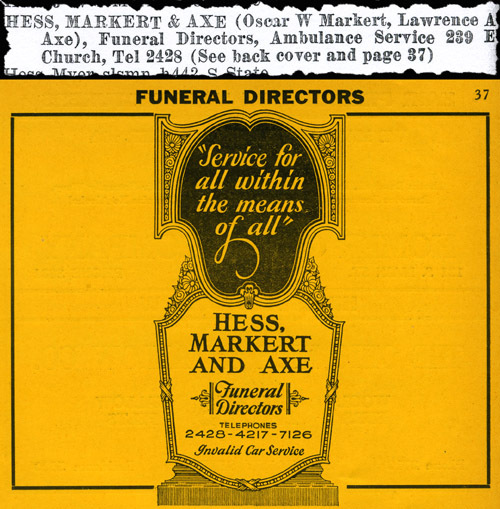 Rocky’s was once home to a funeral home, as evidenced by this 1929 Marion phone book listing and advertisement. Naturally, it would be convenient to argue that it was during the building’s years as a funeral home that a few restless spirits settled there. For her part, Carol remains skeptical. However, she says that, “if there are a few ghosts, I like to think they’re friendly ones.” Or maybe just mischievous ones who delight in unnerving bike mechanics by hiding their tires or shutting doors on them. *For those readers who are members of Facebook and are interested in Marion’s history, I recommend becoming a member of the “Growing up in Marion, Ohio” Facebook group. The nearly 3,000 members have a wealth of information about our hometown as well as a willingness to share it. They were certainly helpful in the development of this story.